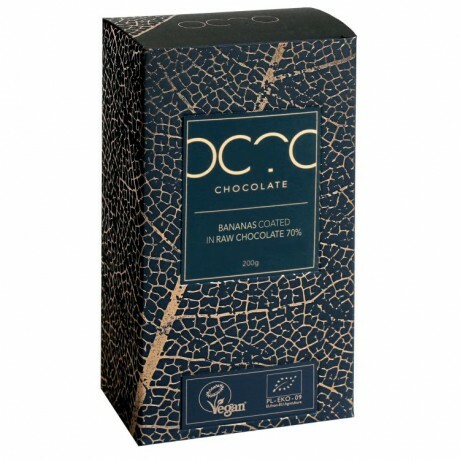 Delicious air-dried bananas coated in a heavenly Raw Craft Dark Organic Chocolate. Chewy but soft, these banana bites greet you with a pleasant delicate centre, a rich fragrant chocolate aroma and leave you wanting for more! A healthy guilt free snack or treat, totally irresistible anytime - great to share or as a gift. 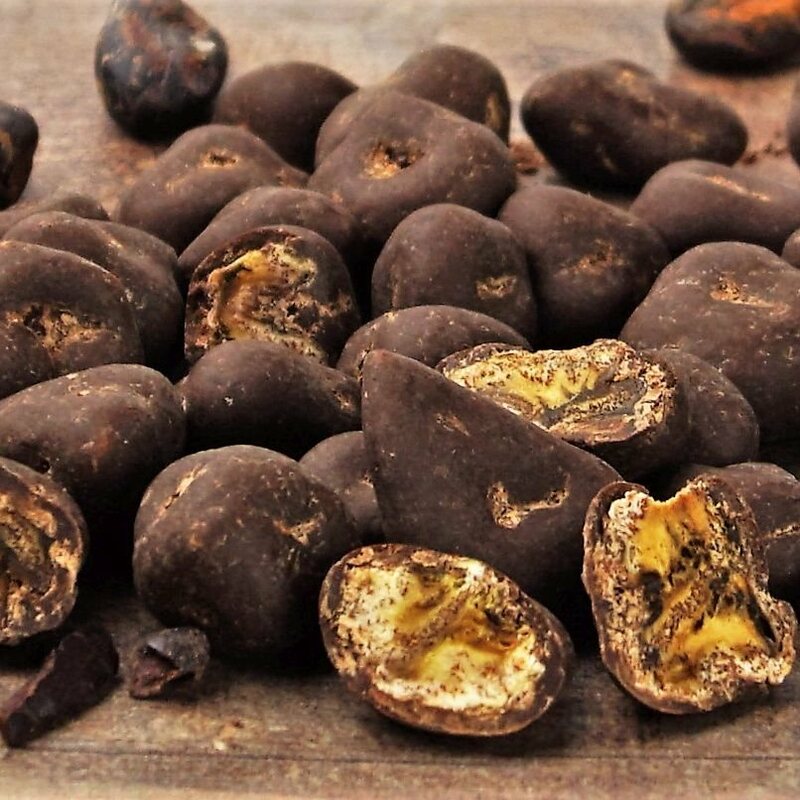 The chocolate is made using only high quality cocoa beans sourced from Ecological/ Fairtrade farming, and sweetened using only the best Coconut Blossom Sugar, which is one of the healthiest natural sweeteners available. Octo process their chocolate at low temperatures to keep it raw and preserve the beneficial nutrients and minerals of raw cacao. 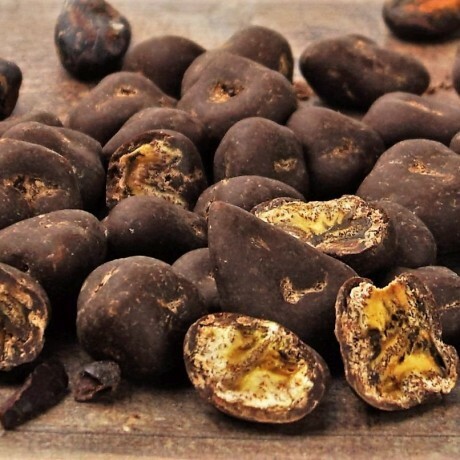 They use minimal processing when creating their chocolate in order to capture and retain a greater level of intensity in flavour and health benefits. Carefully crafted by hand then hand-wrapped and beautifully packaged, this is a truly luxurious treat. Organic, Raw, Vegan, Dairy free, Free from soy lecithin. Shelf life: minimum shelf life of 3 months, standard 12-3 months. Dried bananas 50%, chocolate 50% (cocoa beans*, coconut blossom sugar*, cocoa butter*, Bourbon vanilla* - cocoa mass content min. 70%). * Ingredients from ecological farming. Please note - may contain nuts causing allergy or food intolerance. Octo chocolate products are truly unique, healthy and so delicious! I rather spend a little bit more but know exactly what ingredient I am putting in my body! They use coconut blossom nectar as a sweetener and premium cocoa beans-this makes all the difference. Also all their chocolate is Raw which is a plus bonus point! Absolutely delicious...taste like normal milk chocolate but so much healthier. Good delivery time and good customer service. Highly recommend. A delicious product, beautifully boxed, very well packaged and speedy delivery. Great company. These raw dark chocolate coated cashew nuts are THE BEST you'll ever taste. My son, who's favourite nut is the cashew and who's favourite chocolate is very dark, raved about this gift I gave him. Don't worry, I didn't miss out . . the dark chocolate coated almonds and the dark chocolate coated figs I bought, also by Octochoc, were every bit as delicious!!!! Thank you Octochoc for these delicious foods.